Ilesa (Yoruba: Iléṣà) is a city located in the Osun State, south west Nigeria; it is also the name of a historic kingdom (also known as Ijesha or Ijesa) centered on that city. The state was ruled by a monarch bearing the title of Owa Obokun Adimula of Ijesaland. The state of Ilesa consisted of Ilesa itself and a number of smaller surrounding cities. The Ijesa, a term also denoting the people of the state of Ilesa, are part of the present Osun State of Nigeria, Osun State was part of old Oyo state. 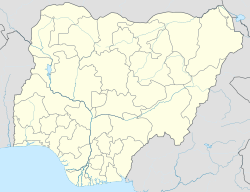 Some of the popular towns of the Ijesa are Ibokun, Erin Ijesa, Ipetu Jesa, Ijebu Jesa, Esa-Oke, Ipole, Ifewara, Ijeda,Iloko, Iwara, Iperindo, Erinmo, Iwaraja, Idominasi, Ilase, Igangan, Imo, Eti-oni,Ibokun, Ibodi and many others. The city described by Rev. Williams Howard Clark in 1854 as: For its cleanliness, regularity in breath and width, and  the straightness of its streets, the ancient city of Ilesa far surpasses any native town I have seen in black Africa. Ilesa is known for its deposits of gold. Owa Gabriel Adekunle Aromolaran II 1982 - ? ^ "Osun 2014: Ijesa North Traditional Rulers Declare Support for Aregbesola". thisdaylive.com. Archived from the original on 2015-02-06. ^ "From Ancient to Modern Cities". thisdaylive.com. Archived from the original on 2015-02-06. ^ "Ajayi Emerges New King of Erinmo-Ijesha". thisdaylive.com. Archived from the original on 2015-02-06. ^ "Osun 2014: The Battle for Aregbesola's Job". thisdaylive.com. Archived from the original on 2015-02-06. ^ "Ilesha". Litcaf. 2017-02-16. Retrieved 2017-06-04.